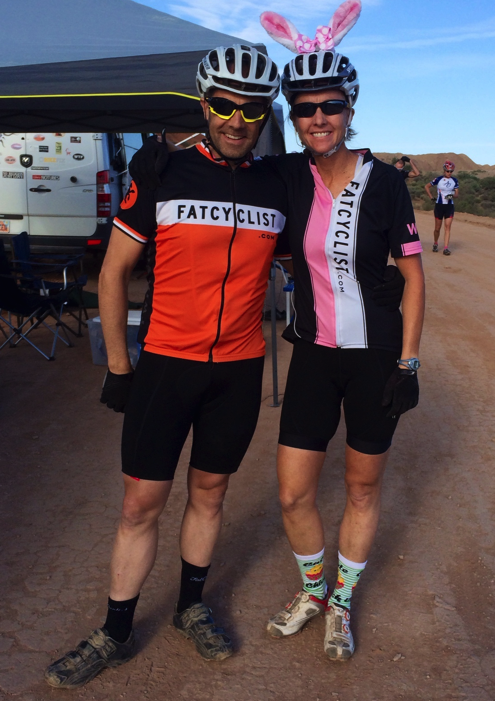 You are currently browsing the Fat Cyclist weblog archives for April, 2014. A Note from Fatty: Today is the last day you can donate to win the dream Gooseberry Yurt weekend vacation. Read here for details, and click here to donate. And thank you to the many of you who have been so generous with your donations. It’s been a real pleasure to watch Friends of Fatty support The Hammer on this big endeavor, and a lot of fun to watch The Hammer be so excited about how incredibly awesome everyone’s been with their donations. More often than not, I really enjoy being right practically all of the time. For example, it’s super useful for calling heads or tails on coin tosses (I can choose correctly with near-guaranteed certainty within two (or sometimes fewer!) guesses). It’s also awesome in arguments, in which I am always right. And there are other practical applications, too, such as in always knowing the correct lottery numbers (I just am not interested in winning). But, occasionally, always being right is a burden. A tragic, heartbreaking burden. 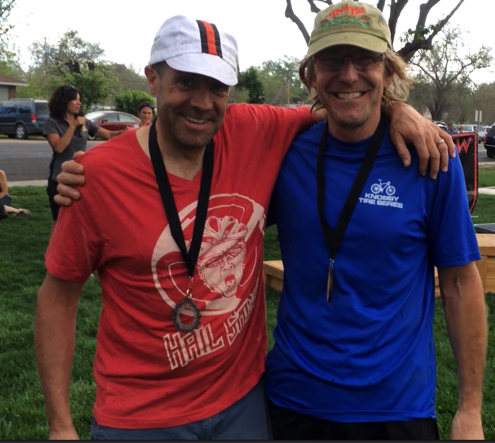 In the last installment of this story, I introduced myself to Mike from Boise, a singlespeeder on a nice, fully rigid Spot bike, and told him we were likely to see each other a lot that day (this is the part where always being correct is occasionally heartbreaking). And then I attacked him. Was it a nice move? Not exactly. Was it a mean move? No, of course not. We were racing. So what kind of move was it? Well, I’d call it a defensive move. Pre-emptively defensive to be sure, but pre-emptive nonetheless. Because I had spoken the truth to Mike, with no strategic subtlety whatsoever: I had to put enough time on him in the climbs that he could not make that time up on the descent. And so I went hard, looking back every time there was a bend in the road, checking to see if Mike was visible behind me. At first he was, and then — after a mile or so of climbing — he wasn’t. I kept the pressure on. I knew it would be close. And as I pushed myself, I thought about the glorious nature of competition and what it can make us do. Here I was, going harder and faster and more intensely than I had any intention of going before this race began. It wasn’t because I wanted a spot at the podium; I had no idea where Mike and I were in relation to other single speeders. It wasn’t even because I wanted to beat Mike. Sure, I wanted to beat him; that’s the nature of racing. But there were lots of other guys out there who I was ahead of, lots of guys out there I was behind. And I didn’t care about them at all. I was suddenly deeply in love with this race, on this day, because I had chanced upon a guy who had an interesting combination of strengths and weaknesses that overlapped with mine in such a way that we were essentially perfect competitors for each other. Mike was going to make me push myself to be a faster descender, and I’ll wager that I pushed him to the limit of his climbing abilities. By the time I got to the top of the five-mile climb, I could no longer see Mike. Maybe, I thought, I’ve done it. And I hit the downhill hard. Going a little faster than I usually would. Being a little more aggressive on the drops. Rolling over stuff I might usually go around. Using a little less brake on the corners. It was a little bit terrifying, but seemed to be working. Whenever I hit a part of the trail that lent itself to looking back, I couldn’t see Mike. I was holding him off. I was holding him off! I got a surge of adrenaline, mentally picturing my ever-so-slight lead growing into a slight-but-still-safe lead as we racked up lap after lap. 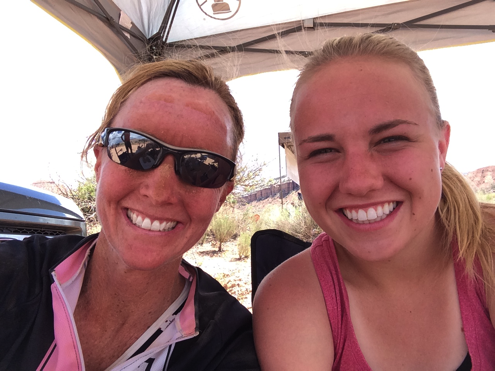 And then, as I exited the first new section of soft singletrack and rode my way up toward the next section—the section that would empty out into the straightaway leading to the timing tent and the beginning of the third lap, I heard a voice from right behind me. He went, and I got to watch him build a second’s lead, which he built into a two-second lead…and then a three…and then a four…. Meanwhile, I did everything I could to keep him in sight. To at least not let him get away from me entirely. I kept Mike’s lead slim enough that during the last short climb to the timing tent I was able to struggle up to his back wheel, hold it for a few seconds while I caught my breath, and then pull up beside him. We finished the second lap exactly together. Yeah, we were kind of closely matched. But the race was still young, and there were a lot of miles for us to battle through. And unlike the first two laps, I’d be starting the five-mile climb on the third lap right beside him — instead of with a deficit. I stopped at our tent, grabbed a new bottle of Carborocket 333 and a quick sandwich to go (the first mile of the climb is gentle, a good place to fuel up), and went out fast. I looked over to my left. There was Mike at his tent, putting a few strokes of air into his tire. This, I thought, is my big chance. If I’m going to beat Mike, I’ve got to do it now. When I’m not riding my bike, running or making dinner for my very large family, I spend about 24 hours a week at work. 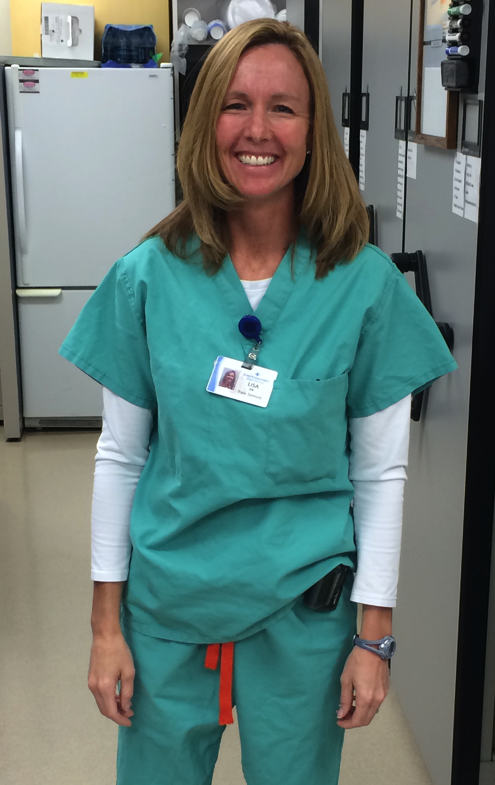 My official work–or job–is an RN. I work in the acute pain service at two very large, busy hospitals in my area. I think I have the greatest job in the world. I work with a great group of doctors, nurses and patients. I work directly with anesthesia. We perform regional blocks and epidurals for surgical patients. We also visit with these patients and adjust pain meds as needed. On a typical work day, I hop in my car and drive either six miles or twenty miles–depending on which hospital I’m working at for the day. I then care for approximately 20 patients during the course of my day. Once at work, the amount of walking I do is minimal. I usually take the elevator up…and the stairs down (yes, I am quite lazy). It’s safe to say that I don’t have to work very hard to access the 20 patients in my care. I have friends that have chosen to take their nursing careers into the home health setting. An RN in the home health setting might see 1-5 patients per day, seeing each patient a couple of times a week. These nurses may travel 2-30 miles between patients. They provide basic nursing care: wound care, vital sign checks, etc. They get paid for gas and an hourly wage. They probably spend less time walking than I do. Meanwhile, on the other side of the world, there are people like Theresa. She is a “caregiver” in a village in Zambia. She lives in a village that covers many square miles. She has no formal education. She has no car. But she does have a kind, giving heart. She cares deeply about the people in her village. She sacrifices time away from her family and home chores to visit with people in need in her village. She provides the whole range of nursing care from wound care and bathing, to delivery of babies and assessing villagers who are sick and afflicted with a variety of diseases — like sickle cell anemia and AIDS, just to name a couple that I saw firsthand. She provides counseling and a listening ear to people who are sad and struggling. 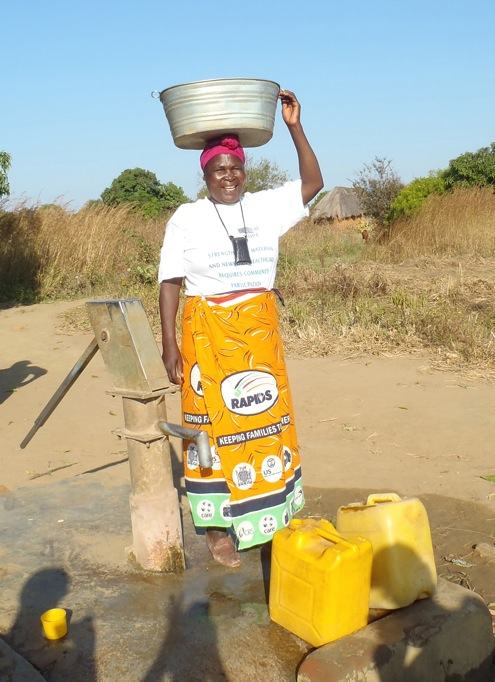 She does chores around her patients huts-collecting water from the well, cleaning etc. The title Caregiver sums Theresa up beautifully. She cares, and she gives care. And without help, people like her spend a lot of her time walking. Theresa’s patients live many miles apart. The nearest clinic may be several miles away. She may see only a few patients a day, because the majority of Theresa’s day is spent en route: Walking miles, most likely on an empty stomach. She doesn’t have the luxury of opening a Honey Stinger Waffle or a GU to help her energy level as she walks. By helping World Bicycle Relief provide caregivers like Theresa with bikes, they can double — if not triple — the amount of patients they can see in a day. They can then spend more time with their patients…as well as with their own families. Since getting a WBR Buffalo Bike, Theresa’s productivity has increased exponentially. When Fatty and I were in Zambia, Theresa shared a story with us about how she was able to put a laboring lady on the back of her bike and get her to the clinic in time to deliever a healthy baby. Theresa then rode back out to the village to care for a sick patient with AIDS who ended up needing medication. Theresa was able to hop back on her bike and return to the clinic to pick up needed medicine. If not for the bike, she wouldn’t have been able to perform any of these activities. Lackson is a newlywed and a caregiver. He took us to see one of his patients and his family. The patient has sickle cell anemia: a very painful condition that goes through periods of remission and exacerbations. This young boy — Louis, on the left in the above photo — can become critically ill quickly and may require hospitalization for multiple blood transfusions and pain meds. His family consists of his mom and brother. There is no father in the home. 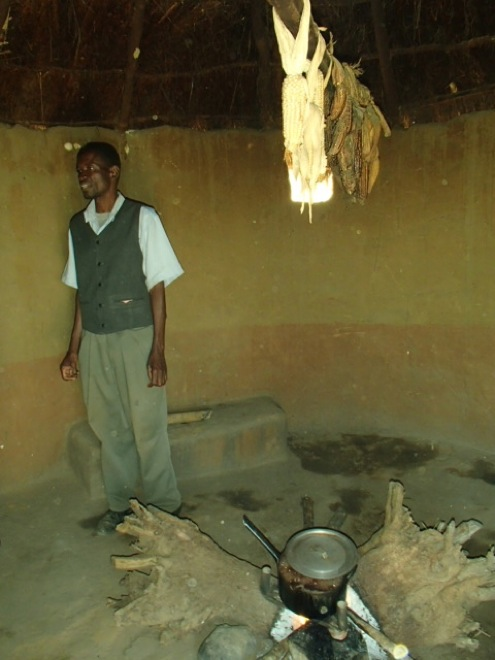 A lot of adult males in Zambia have passed away from HIV leaving their families destitute. Lackson has become this surrogate father for Louis. Many patients that the caregivers will see have been affected by HIV in one way or another. The AIDS crisis has had a devastating effect on the people of Zambia. More than 16% of adult Zambians live with disease. More than 800,000 Zambian children are orphaned because of the disease. Antiviral medication is becoming more readily available, which can prolong the life expectancy of these people. 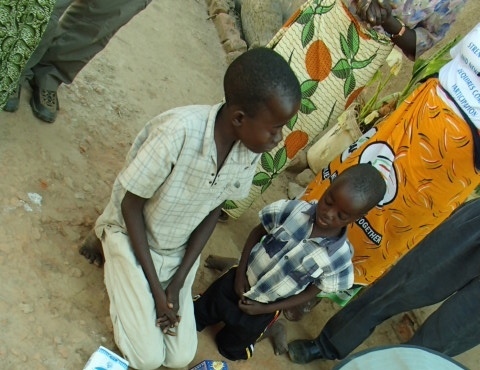 The caregivers provide the mechanism for many of these people to receive their medications. Last week we took our family to Village Inn — a pancake house. We easily spent more than $134 there. Next time, I’m going to propose we skip the restaurant, make our own pancakes at home — and send the money to help WBR and the wonderful caregivers in Zambia. So far, my Weekend at Gooseberry fundraiser for WBR has earned enough to buy 64 bikes. That is awesome. But you know what? I’d love to raise enough for 100 bikes. And now we’re down to the last few days of April, after which I draw a winner. So if you haven’t made a donation (or if you have made a donation but have the money to make another), now’s the time. You can find the details for this contest by clicking here, but the short version is this: For every $5 you donate, you’ll get a chance at winning an incredible weekend at the Gooseberry Yurt. We’ll fly you out there, then either hike, ride, or just hang out and read. It’ll be incredible, relaxing, and incredibly relaxing. But even if you don’t win, you’re going to help a caregiver — or a student — in Zambia do more good and travel farther than they otherwise ever could. And that’s an amazing thing to be able to say. So thanks for your donation! A Note from Fatty: Before reading this installment of this story, you should probably read Part 1 and Part 2. Things had changed. For one thing — as I mentioned at the end of my last post — my position in the race had changed. By one. For the worse. But that’s not what I’m talking about. What had really changed was the Frog Hollow course. Specifically, the most difficult section of the course — a rocky, blocky technical trail segment full of short steep climbs, quick descents and sharp turns — had been replaced by a slightly longer, much less technical section of singletrack that had lots of hairpin turns and right-angle turns and swoopy turns. And by the time I got there, it was already pretty chewed up from people braking hard into the corners, and then stomping hard as they came out of the corners. Powdery, loose desert dirt everywhere, the consistency somewhere between talcum powder, sand, and chocolate milk mix. Maybe if I were better at racing that kind of trail, I wouldn’t be so down on it. The end of the Frog Hollow loop is a short gravel road, climbing up to the timing tent. I rode as fast and hard as I could, straining to look through the dust to where — hopefully — a guy on a Spot singlespeed would be just ahead of me. I came through the tent, realizing that if I hadn’t caught him yet, maybe I wouldn’t catch him at all. But, I told myself, I am a better climber…and the next five miles is all about climbing. And — good news — I had finished the first lap in under an hour, even including the run to my bike, which probably cost two minutes. I was on track to a six-lap race. As solo racers, The Hammer and I had a crew spot set up right on the course, so we could grab stuff and go without having to divert off the course. The Swimmer was ready for me — all set to hand me whatever I wanted. Which, in this case, was a rice cake, a full bottle of Carborocket 333 (Grape flavor: best energy drink I have ever used) and a small bottle of Coke to slug down. In less than a minute, I was off again, wondering both how far ahead of me the guy on the Spot singlespeed was, and how far behind me The Hammer was. I started the five mile climb again, going as hard as I could, knowing that if I were going to move ahead during this race, it would not be during the descent. And about three miles into that five-mile climb, I saw him: the guy on the Spot. My chosen adversary. Suddenly, I had wings. I bridged ’til I was right behind him, getting ready for the attack-pass. But then I did something else, instead. “I’m Mike.” Mike had a friendly voice. That got a groan from him. “Well, I’m sure I’ll see you on the descent in a few minutes,” I said. “Oh, I don’t know about that,” he said. And figuring that was as good a place to end our introductions as any, I stood and attacked. Which is where we’ll pick up next week, in the next installment of this story. A Note from Fatty: To read Part 1 of this race report, click here. In the first installment of this story, I noted that I am a liar. But the truth is, everyone who races is a liar. We lie to ourselves. Whether you’re racing people in real time — like I was in the 6 Hours in Frog Hollow — or racing against other people’s best time-shifted efforts — like everyone does with Strava — you’re lying to yourself. You’re lying to yourself that the race matters. You’re lying to yourself that the race is somehow an indicator of how fast you are. When, in truth, the race doesn’t matter, and your relative speed is only an indicator of how fast you are in comparison to other people who are also lying to themselves. And you know what? Those lies facilitate an incredible, wonderful truth. By telling yourself (and believing) these lies, you put yourself in the position of going as hard as you honestly can. And the feeling you get when you do that is as perfect and genuine as any emotion there is. Racing may in fact be the most beautiful lie we can tell ourselves. I had lied (to myself) incredibly convincingly during the five mile climb. I believed myself when I told myself that I was having a banner day. And why shouldn’t I believe that? I was passing people. I felt good and strong. I looked back and saw that the people behind me were getting further behind. And then I began the downhill. On my hardtail singlespeed (34 x 19, for the three of you who care about singlespeed gearing), with only the barest whisper of front-end suspension (a Rock Shox SID). The thing about the Frog Hollow downhill is that it’s fun. Wildly fun. So wildly fun, in fact, that as you ride you are in real danger of forgetting that you’re racing at all, because the hard-baked desert singletrack is just so good and fast. And fun. But I did not forget I was racing. I pedaled until I was going so fast that pedaling didn’t make any difference (this happens at a lower speed on singlespeeds than on geared bikes, alas). I was setting up my turns so that I could keep as much speed as possible. I did the first big drop without slowing as much as I was comfortable with, went into the second drop with speed, and came to the bottom with just a little too much speed. I washed out into the sand at the outside of the turn, put a foot down, and kept going. “I don’t think anyone could take this part of the trail any faster than I am,” I lied to myself, and then looked back to see if anyone was catching me. I couldn’t see anyone. I was staying clear. I got to the most technical section in the race: go over an iron arch, down a rocky ledge, execute a quick hairpin turn, more drops, another hairpin, and then go. I rode it — not fast, but I didn’t put a foot down. By doing this, I passed a person who had taken a more cautious approach to the ride. Then, down through the dry river bottom, back up onto singletrack, and more go-as-fast-as-you-dare racing. I could say that I don’t see how anyone could catch me when I was going as fast as I could, but that would be a lie. The day before, as we practiced the loop, Heather routinely disappeared far in front of me. “But that’s because she’s on a geared bike,” I had lied to myself that day. Which didn’t really explain anything, because Kenny was dropping me even faster, and he’s on a singlespeed geared almost identically to mine. The truth is, they were faster than I am because I am slower than they are. And as I hit the second section of the singletrack — the same kind of terrain, but not as smooth, thanks to traffic on the trail when it was muddy — I could hear two riders approach as they caught me. At first, I said nothing. “If they want to get by, let them ask me to yield,” I thought. I kept going; they stayed behind me, saying nothing. “I guess they’re happy where they are,” I thought. I got to a brief, rocky series of climbing ledges. It’s good stuff. Stuff I like. I weaved through some, wheelied over others, and just powered up some. I heard the riders (I could hear there were two) behind me. One had a drivetrain problem as he went up one of the rocks — sounded like his chain dropped off — and he stopped, forcing the person behind him to stop. I didn’t look back. I rode on, alone again, nobody on my tail. I was racing, and racing is very important. And then they were with me again. Pfff. But still not asking to go by. “No,” one of them called out. “Yes,” the other called out. “I guess yes,” the first amended. “I’ll pull over right, pass on my left…here!” I shouted, slowing and veering to the right side of the briefly-wider singletrack. A guy on an orange bike — geared, so not someone I cared about — went by, saying “Thanks” as he went by. And then, right on his tail — on what I now saw was a fully rigid singlespeed Spot — was Mike (whose name I did not yet know). “Nice pass,” I said, respectfully. And — right then — I stopped caring about all the other singlespeeders in the race. It had narrowed down to just this guy on the Spot, and me. I was (for now) faster on the uphill, he was faster on the descent. Were we fighting it out to decide who was in fifth place and who was in sixth? Or fourth and fifth? Maybe even second and third? I didn’t know. And, really, I didn’t care. But I did know other things: First, I knew I was in a battle. And second, I knew that this battle was important. Sure, I was telling myself a lie. But it was as true a lie as I’ve ever told myself. And that seems like a good place to leave off ’til tomorrow. A Note from Fatty: Thank you to everyone who has left encouraging messages and helpful feedback about doing the 100 Miles of Nowhere. It’s been just what I need; we’re definitely going to do it. I’m going to put together the necessary logistics (keeping it simple, though) and will have more to announce soon. I am a liar. You can go ahead and think about that previous statement for a moment and decide whether you want to believe it or not, but I promise you: I am a liar. Here, for example, is a lie: I signed up for the Six Hours in Frog Hollow just for the fun of it. The truth is, I signed up because I wanted to beat people. To feel, once again, how extraordinarily awesome it is to be the fast guy. I — secretly, of course, and buried under twelve tons of self deprecation — wanted to show that I am not slowing down. That when I said that last year was the fastest I’d ever be and that I’d never be that fast again, that I was only joking. And in short, I wanted to prove that I have not aged, and also that physics (I’m about eight pounds heavier than I was this time last year) do not apply to me. The Six Hours in Frog Hollow, for most people, doesn’t last for six hours. Indeed, the amount of time a person or team spends racing is almost guaranteed to not be six hours. Also, you’re unlikely to spend any time whatsoever (leave alone six whole hours) in the hollow of a frog. Which means, I guess, that the race name is almost purely ironic. You — either as an individual or a team — start doing the thirteenish-mile course at 9:00am, and you do as many laps as you can. Once you cross the start/finish checkpoint after 2:00pm — five hours (not six) into the race — your race is done. So if you come through at 1:59 you can go out for another lap. If you come through at 2:01, you can’t. 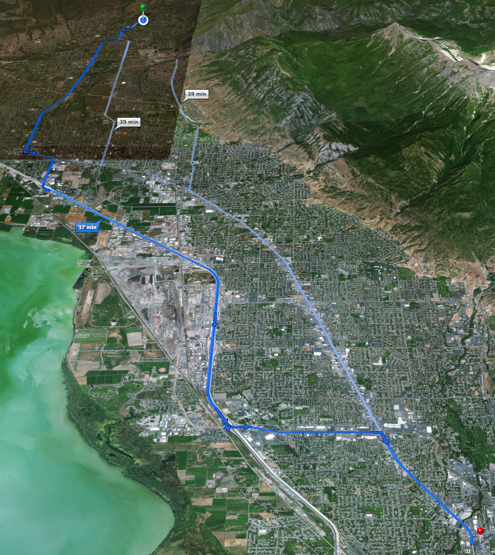 Ride uphill for about five miles, then mostly downhill for about eight. Rinse and repeat, as fast and often as possible. The thing is, for a racer like me, the course takes very close to an hour. So while I had great hopes that I’d finish five laps in under five hours — thus putting me in position to do a sixth lap and probably get on the podium — I really didn’t know whether I’d be able to do it. What do you mean it looks like I’m sucking my gut in? Starting together, The Hammer and I broke into a run at the Le Mans-style start. Quickly, The Hammer developed a lead. Which expanded considerably by the time she got to her bike, jumped on, and took off. I grabbed my own bike and gave chase. And then my chasing gave way to marveling, because I was not gaining any ground on The Hammer. And hey waitasecond, what am I doing behind my wife during a race at all? I stood and attacked. Which made me tired, but otherwise had no effect. So I backed off to the pace that felt right to me and resolved myself to my new reality: I have a wife who is at least my equal on the mountain bike. A mile or so of dirt-road climbing gives way to singletrack and fairly limited options for passing for the next mile or so. So I watched The Hammer disappear in front of me, while I pedaled in a slightly slower group, knowing that there were too many people there for me to bother trying to pass all of them. I’d have three miles of steepish dirt road climbing to do my passing soon enough. I looked a little ways up ahead and saw two guys on singlespeeds. One on a reddish bike that I didn’t really recognize, and one on a nice-looking steel Spot. That guy on the Spot, I would later find out, was Mike, from Boise, Idaho. I’ll explain later how I learned his name and where he’s from. I love getting ahead of myself in these stories, dropping hints and stuff. For now, I decided to mellow out and not worry about passing anyone for now. I’d attack the singlespeeds hard as soon as the road turned steep and up. Make a statement with my climbing, and then hopefully be gone before anyone had a chance to make a counterpoint, as it were. And sure enough, once the big climb of the loop came, I stood up and did what I’m good at: rocking a singlespeed side to side while dripping sweat and snot off my nose onto my front wheel. I caught the guy on the reddish-orange singlespeed. “Hey,” I said. Which, considering that blood was spurting out of my ears and eyes, was pretty darned friendly and outgoing of me. Then I caught The Hammer. Yes, I am crowing about catching and passing my wife. “I love you, Beautiful,” I said as I caught her. I want to be very clear on how sweet I was as I passed. Why? Because this will figure in to the story later on, that’s why. And then I caught up with Mike. Knowing that I was only barely faster than he was on the climb, I wanted my pass to leave him unable to respond. So without announcing myself, I just settled in behind him, catching my breath. Gathering my strength. Then, just before a steep grunt of a climb, I stood up and gave it everything I had. Attacked hard. And it worked. I had dropped him. He didn’t try to stay on my wheel. I didn’t know what place I was in, but I knew it was better than it had been a minute ago. I got to the summit of the climb, turned right onto the fast downhill singletrack, and rode my brains out, happy to know I had seen the last of Mike. I also figured — less happily, but also a little bit relieved — that I had seen the last of The Hammer ’til the end of the race. In both cases, I was severely wrong. Which is where we’ll pick up in the next installment of this story.